The RDX is smoothness incarnate with an attractive profile, punctuated by pronounced fender arches. Inside, there's a characteristic Acura form and function dominate, with well-placed central dash controls and an abundance of soft-touch materials and matte surfaces that communicate an upscale essence. The cabin is a haven of quiet spaciousness. You'll find remarkably roomy back-seat legroom and comfortable, supportive front seats that soak up miles on long trips. The 2015 Acura RDX is powered by a 3.5-liter 24-valve, SOHC i-VTEC V6 engine that delivers 273-horsepower, providing strong acceleration off the line and for highway passing. The standard transmission is a six-speed automatic that automotive journalists applaud for its timely, seamless shifts. Test-drive a 2015 Acura RDX in Peoria. You'll be pleased with its thoroughly composed handling, comfortable ride and strong brakes. The RDX's offers a generous list of standard features, including include a rearview camera, push-button start, dual-zone automatic climate control, leather upholstery, heated front seats, Bluetooth, a USB port and satellite radio. The RDX boasts very strong crash-test scores from both the federal government and the IIHS and has a full complement of elements, both in its design and safety features to maintain those ratings. Standard safety features include side, and side-curtain airbags, along with anti-lock brakes, stability and traction control, daytime running lights, a backup camera, and a rollover sensor that triggers appropriate airbags. 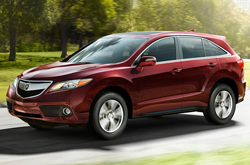 2015 Acura RDX reviews agree its strong-yet-efficient V6 delivers ample power and strong fuel economy. Add to this its great resale value, quality, comfort, upscale appointments and outstanding spaciousness, and it is easy to see why the new RDX is such an appealing choice in a sea of lesser crossovers. See the 2015 Acura RDX in Peoria at Acura of Peoria.